10mm Open Roses from Wild Orchid Crafts. 50 mixed pink roses. 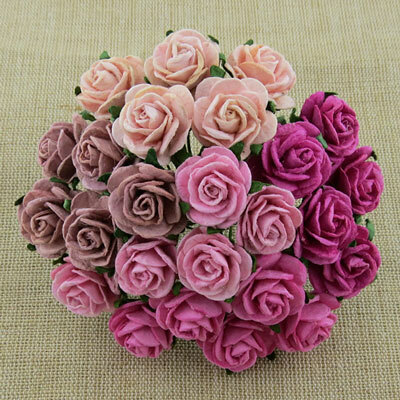 These beautiful mixed color open roses are handmade from fine quality mulberry paper and measure 3/8" (10mm) across. They have a long thin bendy green wire stem that is 2-1/4" to 2-3/4" (6 - 7cm) long, and are ideal for wedding or all other card and craft making projects. This item is sold in packets of 50 roses. Colors might not always be exactly the same as the display picture. Price is for a package containing 50 roses.